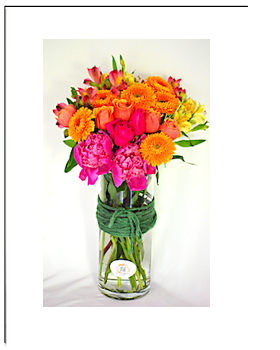 VF22 Flower Arrangement in Decorated Glass vase as a centerpiece for coffee table, conference table, or desk, home or retail flower display. Vibrant, eye catching warm colours of gerberas, roses, carnations or your choice of flowers and colours as gifts for all occasions. Flower Gifts in a glass vase. Send a vase full of flowers in water. No more looking for a suitable glass vase for flowers. Just enjoy the flowers straightaway.